You are here: Home / Dining Out Gluten Free / Beef O’Brady’s Gluten Free Menu: A+ All the Way! Beef O’Brady’s Gluten Free Menu: A+ All the Way! Sure, I’ve had to toss a few aside (I really miss you, Fazoli’s), but some are keeping in step with what has become a major health issue. Some restaurants, like Beef O’Brady’s, are strapping on superhero capes and making the world an easier, better and yummier place for all of us. As the Beef O’Brady’s Gluten Free Menu on their website shows, there are plenty of great options for lunch or dinner. While a lot of eating out GF is good old common sense, I appreciate it when restaurants take the time and effort to put together a Gluten Free Menu. 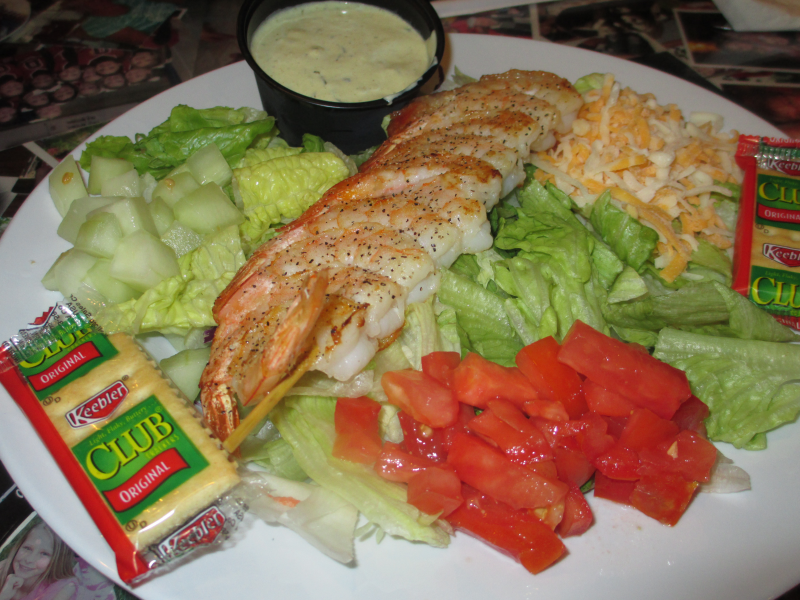 * The salad pictured above was a Grilled Shrimp Salad at Owensboro’s Beef’s I had months ago. I’m not even sure it’s still available and I”m even less sure that it’s GF. Of course I know the crackers aren’t, but the salad was one of the best salads I’ve ever had in my salad-loving life.